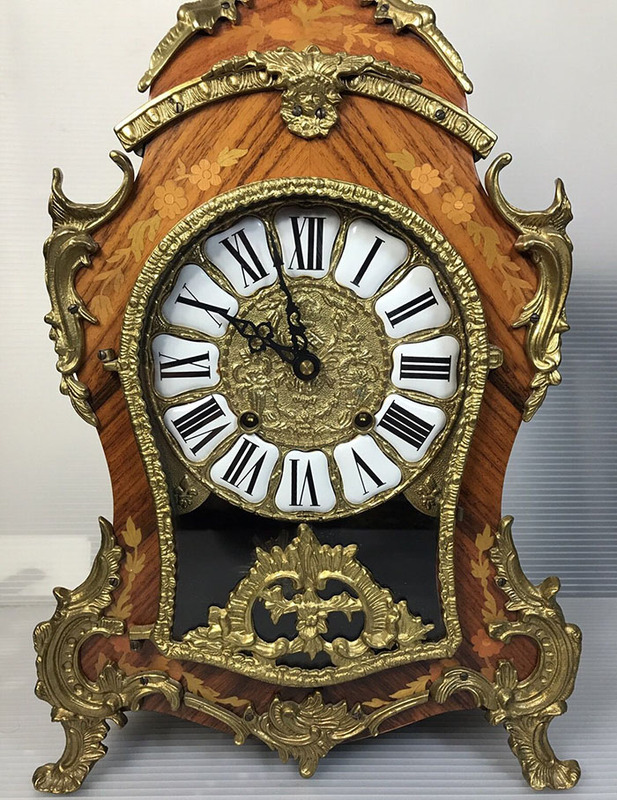 This clock is an 19th century clock that is an antique. 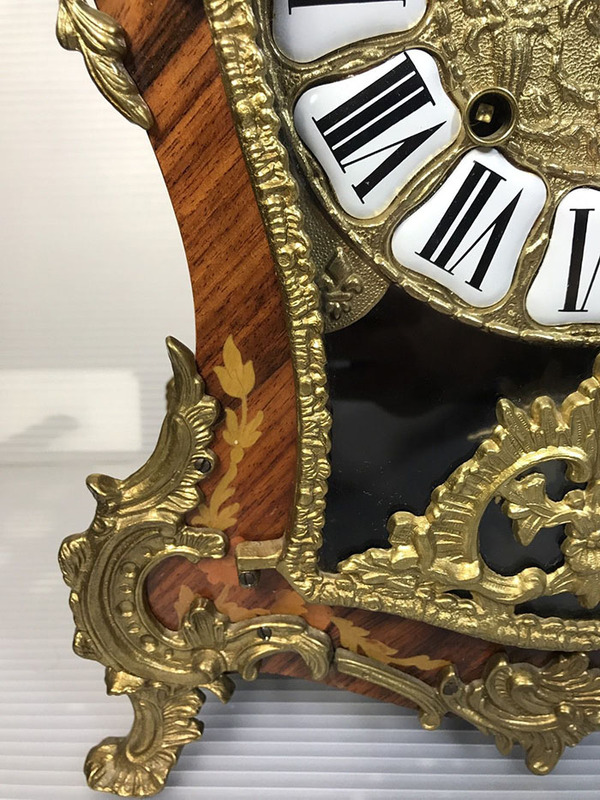 This clock is living on through its beauty and its elegance, as well as charm. The clock has been serviced regularly by a professional clock maker. The parts are all in working condition and are fully serviced. The clock itself keeps great time and all the elements of the clock are in great shape. This clock is an antique and is in great condition for being a used clock. 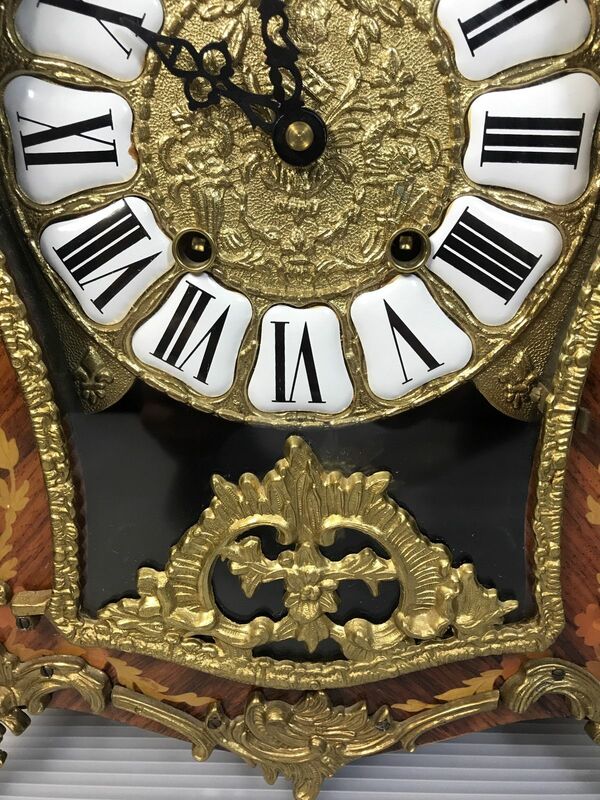 There shows little to no wear and tear mechanically or cosmetically with this particular Ormolu French Boulle Walnut Mantle Clock. These clocks are called mantel clocks. They are called mantel clocks because back when they were originally made many people placed these smaller clocks on their mantles or fireplaces as a focal point of their room instead of larger wall hanging cuckoo clocks or grandfather clocks.. It was great way to keep track of time as well as make a statement with the beauty and boldness of these clocks. This clock is an eight-day clock with a gold glided style. The style of this particular mantel clock is beautiful. It has many unique design features. The dial of this clock is unique as well, it is gold with white boxes holding the black lettering. The hands are also black which compliments the gold on the clock. The whole clock has gold accents. The clock itself is made of a beautiful light-colored wood with beautiful grain. The stain of this clock makes the grain stand out and really makes the painted details pop. Painted along the clock is flowers on vines. They are almost an angelic color because they are all light colors that really make the clock different than any other clock. The clock stands on intricately designed legs painted gold. All the detail on the gold accented pieces is amazing.